Join us for your very own Dolphin Swim Adventure! You will get to kiss, pet, and hug your new dolphin friend, plus take a ride across the water on his belly! For 30 full minutes, you can dance and splash with dolphins in the sparkling Atlantic ocean off Jamaica's coast. If swimming with dolphins has always been your fantasy, join us at Dolphin Cove Montego Bay in Jamaica for a Dolphin Swim Adventure. 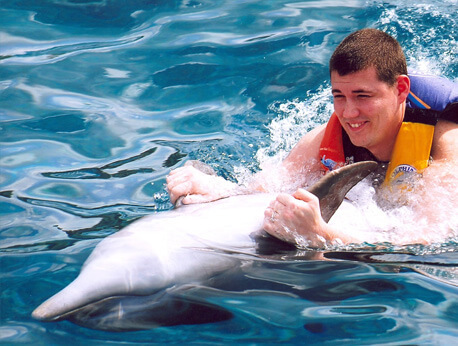 This program allows you to get up close and personal with one dolphin, who will be your new best friend for the day! You will get to hug, kiss, and dance with the dolphins as you splash around in the deep blue ocean waters for a full 30 minutes. You will also hold onto the dolphin’s flippers as you on a ride across the water on their belly! Our dolphins will keep you smiling as you enjoy playing in Jamaica's beautiful sunshine and glittering Atlantic waters. This fun experience is one you are sure to remember for a lifetime. After your swim with one of our friendly marine mammals, you can spend the rest of your day at Dolphin Cove Montego Bay watching our shark shows or petting our stingrays or camel friends. You can also shop or just relax and sunbathe on our 23 oceanfront acres, enjoying the sun and crystal clear waters of Montego Bay. This life-changing experience costs $149 for adults (over age 13) and $99 for kids ages 6-12. We love kids, but for their safety children under 8 may not take a belly ride from the dolphin. Children under 4'7" must participate with an adult; kids taller than 4'7" may swim alone but must pay the adult ticket price. Prices include a 30-minute orientation, 30 minutes of playtime with a dolphin, access to our shark shows, and interactive experiences with our stingrays and camels. We require that all of our guests know how to swim before registering for this experience. Unfortunately, for your safety, we ask that pregnant women not participate in Dolphin Swim Adventure. Please wear biodegradable sunscreen for the protection of our dolphin friends and their gorgeous environment. Approximately 30 minutes in the water with the dolphins.